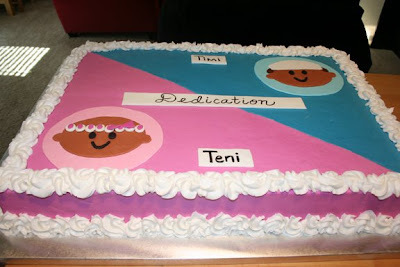 This cake was made for the dedication of twins! It's designed to match the Evite that was sent out ( I do a lot of matching for Evite it seems!) so I hope I did it justice! This a full marble sheet cake with vanilla buttercream and marshmallow fondant. This cake gave us a lot of trouble! What we thought would only take us an hour or two (with the fondant) turned into 5 in the morning! Either way, we're happy with the result and I hope the parents are pleased as well!